Forging just one iconic big screen performance is no easy task for any actor, but sustaining that peak beyond a single role and into an entire career of fulfilling parts presents an even greater challenge -- one that the weathered protagonist of The Hero has sadly failed to overcome. On the other hand, the actual star behind said character, the great mustachioed Sam Elliott, has had no short supply of notable movie performances, and thankfully his turn here ends up being no different. The script itself, however, is a little less successful. The story focuses on Lee (Sam Elliott), an aging actor once famous for starring in a popular western back in his prime. When Lee finds out that he has cancer, the disillusioned man starts to reevaluate his life and his fading legacy. Faced with his own mortality, he reaches out to his estranged daughter (Kristen Ritter). At the same time, he starts to kindle a romance with a young stand-up comedian (Laura Prepon) and attempts to find a meaningful movie role that will bring a proper end to his career. As one might gather from reading that above synopsis, the script here isn't particularly unique. Films about men confronted with illness or old age as they lament past mistakes or spark up flings with younger women are quite common in Hollywood. In fact, much of the movie could be seen as a western spin on Sofia Coppola's Lost in Translation. Still, what the story lacks in originality it mostly makes up for in execution, resulting in a heartfelt examination of regret, second chances, and renewed purpose. 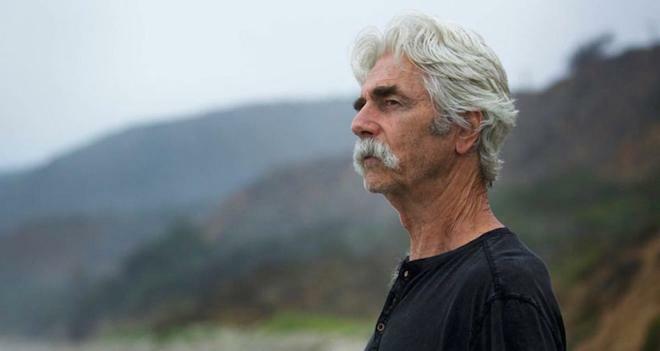 Understated yet palpably affecting, Sam Elliott's performance is the real star here, and it's the actor's soulful malaise that ultimately makes the film work as well as it does. Using his actual baggage as an iconic silver screen star to his advantage, Elliott imbues the role with a lived-in authenticity and brings a delicate air of melancholy loneliness to Lee's predicament. With his weathered eyes and deep, trademark drawl, the actor is able to express more with a simple gaze than many performers can with a whole page of dialogue. And thankfully, director/co-writer Bert Haley appears to be very well aware of that fact, wisely offering a restrained yet effective style that quietly bolsters the film's performances and bittersweet tone. For instance, the first few scenes keep the camera focused on Lee's face alone while other characters remain off-screen, helping to further a subtle sense of isolation as we hear other voices but only ever actually see Elliott. Likewise, the movie's handheld, gently swaying compositions all work to build an overall drifting rhythm that helps to lend the images a pensive quality. Of course, elements of the narrative do come across as clichéd and far too familiar as Lee works on himself and inevitably has setbacks with his daughter and his new girlfriend, but there's a level of sensitivity both in front of and behind the camera that enriches these tried-and-true beats. 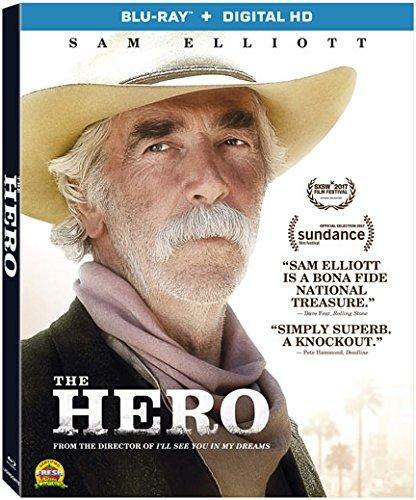 Unassuming yet affecting, The Hero becomes a great showcase for Sam Elliott, offering a memorable role that Lee himself would likely have been proud to play. Lionsgate presents The Hero on a BD-50 Blu-ray disc housed in a keepcase with cardboard slipcover. Instructions for a Digital Copy are included inside. After some skippable trailers, the disc transitions to a standard menu. The packaging indicates that the release is region A coded. The movie is provided with a 1080p/AVC MPEG-4 transfer in the 2.35:1 aspect ratio. Intentionally stylized with a predominantly cool cast, this is a solid picture with only a few minor issues. Shot on the Arri Aelxa, the digital source is fairly clean though the movie seems to have some light artificial grain/noise applied. 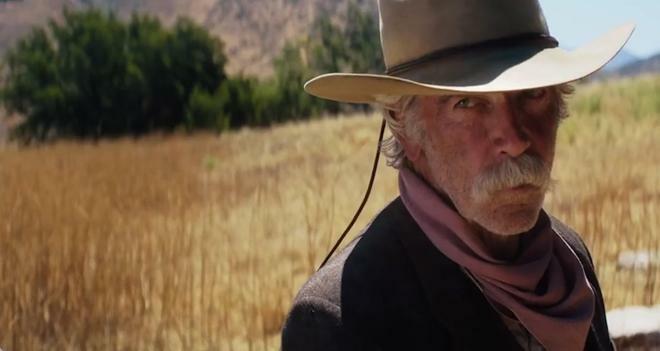 Clarity is nicely resolved highlighting all of Sam Elliott's grizzled features, but fine detail is on the soft side. The color palette emphasizes blues and greys, complementing the story's lonely, bittersweet tone. With that said, there are some key scenes that veer toward a warmer look, including some dream sequences meant to evoke a western feel. Whites are bright and shadow detail is rendered well. Pesky digital artifacts are mostly absent, but I did notice some light false contouring during a few fading transitions. The Hero might not have a conventionally impressive aesthetic, but the transfer seemingly does a good job of reflecting the director's intentions. The film is presented with an English DTS-HD MA 5.1 track, along with optional English SDH and Spanish subtitles. Modest yet marked by some delicately effective design work, the mix offers a subtle sense of immersion. Speech is crisp and full-bodied throughout, giving proper resonance to Elliott's deep, trademark voice. Ambience is spread fairly well, layering in rain, rustling wind, and breaking waves during the numerous introspective shots of Lee staring out at the ocean. Voices and other effects move from left to right when called for with smooth imaging. And though on the quiet side, some music choices do offer some deep LFE cues. Though far from a truly standout track, the audio here suits the material well, offering a gentle extension of the film's reflective mood. Audio Commentary – Writer/Director Brett Haley and actor Sam Elliott sit down for this track. The pair discuss the writing process, Elliotts's iconic voice, the actor's connection to the character, sound design, and the filmmakers' overall approach to certain scenes, rounding out a steady and worthwhile conversation. Photo Gallery (HD) – A gallery of 24 stills from the film is included. The film's script isn't very original, but The Hero rises above its familiar narrative thanks to an affecting performance from Sam Elliott and some thoughtful direction behind the camera. The video transfer and audio mix are both solid, complementing the movie's introspective tone well. And when it comes to supplements, the included commentary provides some decent insights into the production. Worth a look.